Our "Pen"dants or Lanyard pens are a great gift for teachers, nurses and those that are always in need of a pen.They unscrew from their cap which can be put on a chain or a key ring to attach to any lanyard. Our Craftsman Series are special because have a little more flair or design than the single color options. The pens are approximately 3 1/2" long and made of solid wood turned on my lathe. 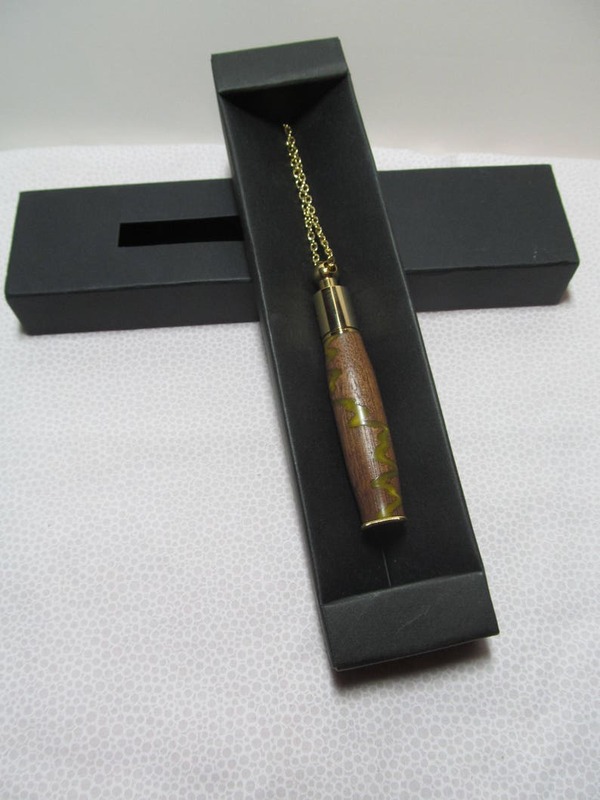 This pen is made from Spalted Maple that was cut apart and glued back together with a special glow in the dark Yellow resin. Note the 4th Picture shows a similar pen with a Blue glow the pen in this listing glows Yellow. Please see our other listings for multiple styles. The Key Ring also comes with a fabric cord. The chain option comes with a 22" gold chain with clasp, please let us know if you would like a different length.